Sometimes you don’t need to send a large shipment overseas, but simply want to send a postcard to a relative in Sweden or a letter to a friend in South Africa. Stamps.com makes it easy! You may already be familiar with our Original NetStamps product. The great thing is that they can be used for both domestic mail and international mail! Keep in mind that Custom (Photo) and Themed NetStamps can only be used for domestic mail. If you need Original NetStamps, you can order them easily from our Online Store at different quantities. No guesswork is needed: if you need the current international letter or postcard rate, please click on the icon bearing the image of a globe and the word “Intl.” to access our International Rate Calculator. Select the country, territory, or dependency to which you would like to send mail. Select the mailpiece type and enter the weight of your mailpiece. If your mailpiece is less than a pound, enter zero for its weight. Click on “Check Rates.” You will be given a list of available mail classes and rates for the country you have selected. 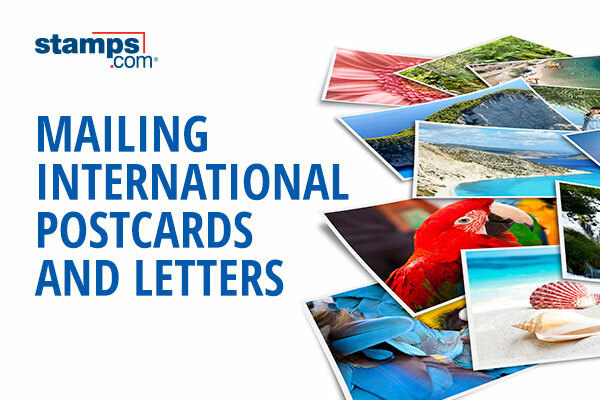 You would not generally need a customs form for international letters or postcards; you would only need one if your mailpiece is 16 ounces or greater or has a declared value of $400 or higher. Click on the “Use This Rate” button. Once you click on “Use This Rate,” you will be taken back to the NetStamps page. Now all you have to do is type in the serial number under “Print Details.” You’ll find the serial number on your actual Original NetStamps sheet. You can print a full sheet of international stamps by making sure that the “Print All” box is checked. You can also print just one by selecting the Print Quantity. Click “Print Postage” when your sheet is ready to be printed. That’s it! Now all you have to do is affix your stamp to a postcard or letter. NetStamps do not include an address, so make sure you write the complete international address clearly on your mailpiece. No need to wait in line at the Post Office—you can drop your mailpiece off at a USPS blue collection mailbox or in a Post Office mail drop slot.